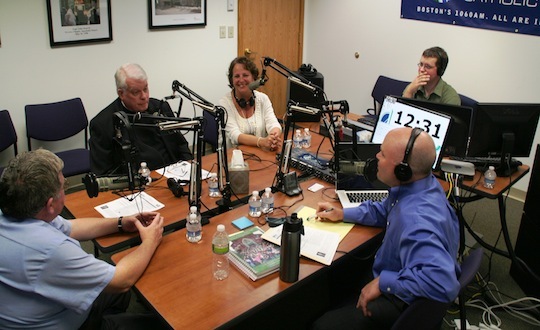 Today’s guest(s): Father Patrick Byrne, former International Secretary General of the Holy Childhood Association; Father Rodney J. Copp, JCL, Director of the Pontifical Mission Societies in Boston; Maureen Heil, Director of Programs and Development for the Pontifical Mission Societies in Boston. Today’s topics: The four Pontifical Mission Societies, the international work of the Holy Childhood Association, how Holy Childhood Association programs impact Boston children, and Fr Pat’s mission work in Ecuador. Summary of today’s show: Scot, Fr. Patrick Byrne, Fr. Rodney Copp and Maureen Heil discuss the work of the Holy Childhood Association both nationally and internationally, and Fr. Byrne discusses his work in the missions. Scot asked Fr. Pat why he wanted to be a priest, and specifically why he wanted to be a missionary priest. Fr. Pat said he grew up in Ireland in the 1950s as the oldest of 6 children, and a lot of boys thought about the priesthood – especially in that time as a young boy, there was a sense of adventure and romanticism attached to the missions still. After a high school presentation from a Divine Word Missionaries and attending a vocations retreat, he joined them in 1967. Fr. Pat said that while the majority of his class went to a local seminary, he got the opportunity to go to London and do his theology studies there. He was ordained two months before his 24th birthday, and was sent to Ghana for 6 months right out of seminary. After those 6 months, he returned and did 6 years of vocations work in Ireland and Great Britain. Scot asked Fr. Copp to speak about the Missionary Co-operative program in the Archdiocese and how many missionaries it brings into the Archdiocese. Fr. Copp said that each parish gets a missionary, but some have several parishes so it is hard to give a quick count. The visits serve a dual purpose, he continued, in that the missionaries can receive not only financial support but prayerful support, and the people in the parishes receive formation and education about the missions. Scot asked Fr. Copp to talk about the Pontifical Mission Societies – people in Boston may know them as the Propagation of the Faith, but there are actually four societies all over the world. Fr. Copp explained that the Society for the Propagation of the Faith is the biggest society; the Society of St Peter Apostle supports the formation of priests and religious, the Holy Childhood Association facilitates children helping children through prayer and sacrifice, and the Missionary Union of Priests and Religious is a spiritual support group for the other three societies. Scot and Fr. Copp also discussed that while the Pontifical Mission Societies have offices here in the Archdiocese and that Fr. Copp serves at the pleasure of the Cardinal, much of the policy, fiscal decision-making, and reporting structure is to the National Office and, through that office, to the Congregation for the Evangelization of Peoples in Rome. Scot asked Maureen to describe how Boston fares on the national scale with support of the Missions. Maureen answered that Boston has a huge history of supporting the Missions – both Maryknoll and the St James Society were founded in Boston, leaving the area with a rich history of sending missionaries that many other places don’t have. About $60 million is sent from the United States each year to Rome for the Holy Father and the Congregation to give to projects internationally, she said – and most of that is from the average person in the pew giving a small donation. Scot asked Fr Copp why the average parishioner should be aware of the missions. Fr Copp said that, as is read at many baptisms from Matthew’s Gospel, Jesus told us to go forth and baptize all nations – and that call belongs to all Catholics by reason of baptism. To not have that part of one’s faith, he said, is to be missing a big chunk. Every Catholic is called to spread the faith however they can. Fr Copp said he explains to people at parishes he visits that “some people give by going, and some people go by giving.” People who go to far away lands and leave family and familiar language behind are one type of missionary, Fr Copp said, but the vast majority of people will be missionaries because they support with prayer and sacrifice, even though they may not see directly everything they are supporting. Scot asked Fr Copp what has been the biggest surprise for him working as Director for only just over a year now. Fr Copp said he enjoys the daily geography lessons and the support from his staff, but truly loves meeting all the people who come to the office. Scot asked Fr Pat what it was like to go into a parish for just one weekend to preach for the missions. Fr Pat said that he knows some of his fellow priests who would be scared to do the job – to walk into a place in a strange country. He explained that he’s always excited when he gets assignments, even when he’s not positive specifically where he’ll be preaching. Fr Pat said that the biggest support is knowing he has a message to convey to the people he’ll meet when he’s preaching and when he greets parishioners after Mass. 2nd segment: Scot started the segment by asking Fr Pat about the founding of the Holy Childhood Association. Fr Pat said that some older listeners may be asked to help with “African” or “pagan babies” – the language of the time. In 1843, Fr Pat continued, Bishop Charles Forbin-Janson was very distressed by reports coming out of China about the number of babies that were dying, young girls especially, because they were abandoned by their parents. The Bishop asked children to pray for the children in China and give up pennies to support the work of the sisters who were caring for these orphans. From that humble beginnings, Fr Pat said, the Holy Childhood sends $25 million to over 3,000 projects worldwide each year. Most of those projects involve young children infected with HIV/AIDS, helping child soldiers return to normal lives, and assisting orphans and street children. Scot asked how many countries contributed versus how many countries receive money – Fr Pat said the amazing thing about the Holy Childhood Association model of children helping children is that all countries contribute, even the poorest. He told a story of receiving $50 from Liberia for the world fund, even during the middle of their brutal civil war. While the recipients are many of the poorer countries you would think of, Fr Pat concluded, all countries are involved in supporting each other through prayer and sacrifice. The aim is not charity, as with many other organizations, but to raise money and prayers in solidarity with children all over the world. Scot asked Fr Pat about a project that sticks in his mind. Fr Pat said he always likes to see progress being made as a result of the projects. One of his first trips, he said, was to a hospital for babies with AIDS in South Africa in 1999. Many of the children looked healthy, but all of them were dying by the time they were 5 years old. In Zambia in 2008, he visited another care center, and the children are now living until 15 or 16 years old due to the care that Holy Childhood Association projects are providing. Scot asked Maureen what we do here in Boston to raise money for the Holy Childhood Association. Maureen replied that there are many programs that vary between parishes and schools – programs can follow the liturgical year, be integrated as part of Geography or English programs in a Catholic school, and be activities tied into holidays. Maureen explained one program during Thanksgiving has many handcrafts that the children can make that feature the colors of the World Mission Rosary. Then, when they are at the Thanksgiving meal, they see the colors and remember to give thanks for all that they have that another child poorer than them may not have. Maureen said that Holy Childhood has two important pillars – prayer and sacrifice. Those pillars, she continued, cannot exist without each other. Asking children to reach into their pockets alone doesn’t convey the message of stewardship. Maureen said one thing she teaches in all the schools is that “found money is mission money” – if you found it and it wasn’t yours to begin with, someone else probably needs it more than you. Maureen also said that an important part of the sacrifice is that it is the child’s sacrifice, not a handout from their parents – the child makes a pact with God about what they’ll sacrifice and offer up in prayer. Scot asked Maureen what people could do to find out more about the Holy Childhood Association programs if there was not already an active program in their parish. Maureen said they should speak to their school’s Principal, Director of Religious Education, or Pastor – she and Fr Copp both stressed that these programs are not only approved of but highly recommended by Cardinal Seán for implementation in all grade schools and religious education programs. Scot said that it must be important that the children feel they are not just doing it for God, but also for people who really need it, and that as a parenting vehicle it helps everyone involved be less materialistic and consumeristic. Maureen said it also teaches stewardship from a very early age, giving the next generation of Catholics a good foundation of thinking of others in the ministries of the Church. Scot asked Fr Pat what surprised him the most when he took over as Secretary General of the Holy Childhood Association in Rome. Fr Pat said he had some exposure to the society as a National Director in Ecuador, but didn’t appreciate the extent to which the Association exists all over the world. When he started traveling, Fr Pat said he would go to a school in the middle of nowhere late at night and there would be a thousand children eager to sing songs, recite poetry, and say prayers in their own language. Fr Pat continued and said he was very conscious as well of the people on the ground working. The people living the message of Jesus in dangerous conditions were inspiring to him, especially the native sisters. Scot, Fr Pat, and Maureen discussed the differences in the level of poverty – $5, Fr Pat said, is a small fortune even for an adult in some places in Africa and other poor areas. Maureen said that something many kids don’t understand is just how far those $5 can go. That amount of money may feed fifty children in Haiti for a day, or give ten children bags of IV fluids to save them from dehydration and malnutrition. Maureen highlighted that in Africa, malaria is still almost as much a problem as HIV/AIDS. She said sacrifices work almost like the loaves and fishes miracle Jesus takes what we think of as small sacrifices and makes them have massive impact. 3rd segment: Scot started the final segment of the show by asking Fr Pat about his experience in Ecuador. Fr Pat said that while he was working as a vocations director in England, he had the opportunity to visit Mexico during Blessed Pope John Paul II’s first trip there as Pope. Fr Pat said before he went to Mexico, he always thought of mission as somewhere like Papua New Guinea, as far away as possible. But when he was in Mexico, Fr Pat said he realized how much he enjoyed the area and the people there and later returned to learn Spanish. He explained that Ecuador has a diverse population, made up of many native Indians, black Ecuadorians who trace their roots back to the time of the slave trade, with a large group of Caucasian and mixed-race people. He said that even though the atmosphere was generally Catholic, there were many different ethnic perceptions of religion, faith, and God. Fr Pat continued his story, saying that his first six years in Ecuador were spent in education as a chaplain and then later as headmaster of a small city four hours south of Quito. He said even though he originally didn’t want to work in schools, he was dedicated to it because his job was to do what was needed. He looked back on it later and said it was a good thing because it helped him sharpen his language skills. After that assignment, he went into mission animation – creating a mission awareness among people. Ecuador was a country that needed help to look outward from itself, he said, and people were very focused on their own problems and nowhere else. Fr Pat said his greatest experience was learning to listen to the people around him. Fr Pat said the overall role of the Missionaries of the Divine Word was to be an advocate for mission and encourage the role of the universal Church in local areas – local people becoming missionaries and going to witness to the worldwide needs of people. Scot wrapped up the show by asking Maureen how people can find out more about the Pontifical Mission Societies. Maureen said that people can learn more by going to their website, calling them at (617) 542-1776, or emailing them at info@propfaithboston.org. Maureen said they are happy to send information on any of the four societies or how people can get involved in mission support programs. Fr Copp concluded the segment by asking listeners to pray for the work in the missions and to speak to their pastors about supporting the Pontifical Mission Societies through Mass cards and enrollments.